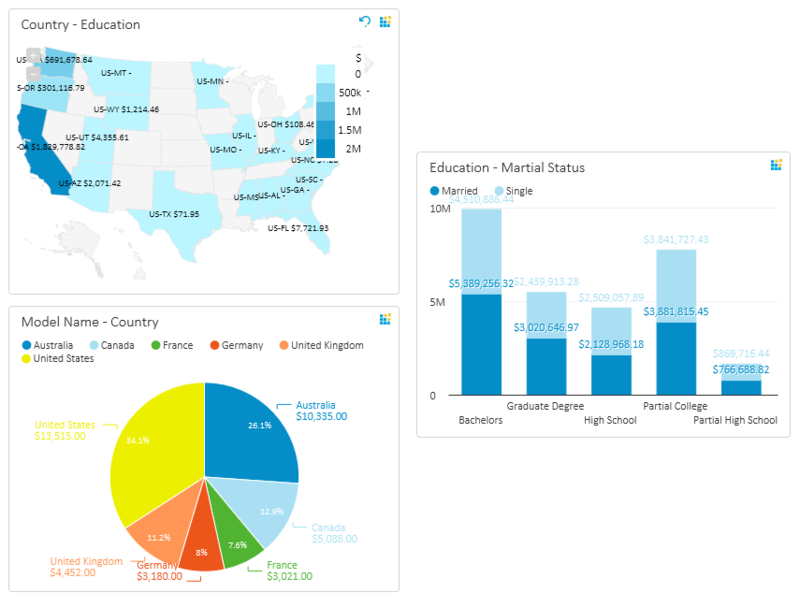 Dashboard Visualization Options delivers new features to customize appearance of dashboard tile and its corresponding data. 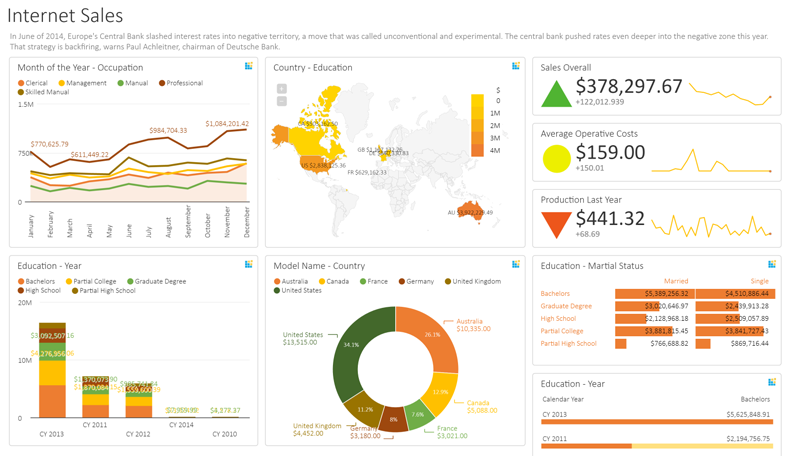 Each dashboard tile has visualization options that are easy to configure to maximize perception of related data. Set dashboard color theme pallet that will be applied to all dashboard tiles or set color pallet for particular tile visualization. By default, all dashboard tiles inherit color theme from dashboard (General Settings) which is by default 'Standard' color theme. While in dashboard 'Design view' user can opt color theme for whole dashboard or set individual tiles color theme. Kyubit product delivers 5 color theme pallets (Standard, Warm, Cold, Strong, Gray), while with some workaround, custom color pallet could be created for the current environment to be available for all users designing their dashboards. 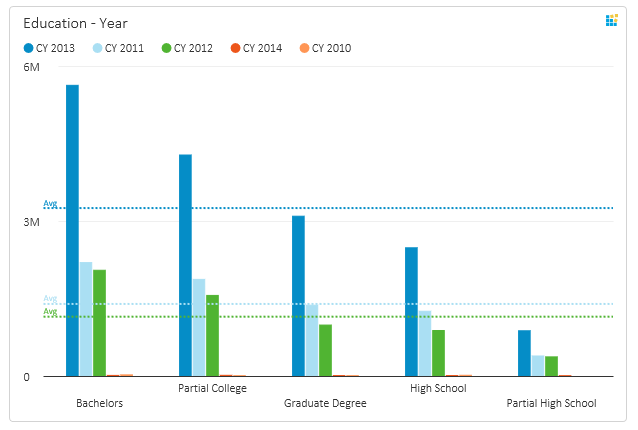 All chart visualization have option to display 'Value Labels', which means that value for particular chart segment will be visible without having to move mouse over it, which is particularly practical while exporting dashboard to PDF file or watching Dashboard tiles on slide show. Charts that show many items are not practical to show value labels for all chart members, simply which would make chart and values not readable and perceptual. Set options to display value labels only for particular categories or series, or display value labels only for TOP n items with highest values. OLAP analysis, MDX and SQL queries returns data structures that consist of categories and series to be visualized on the dashboard charts. In dashboard 'Design View' user can select to show only particular categories or series and narrow focus to the data of current interest. 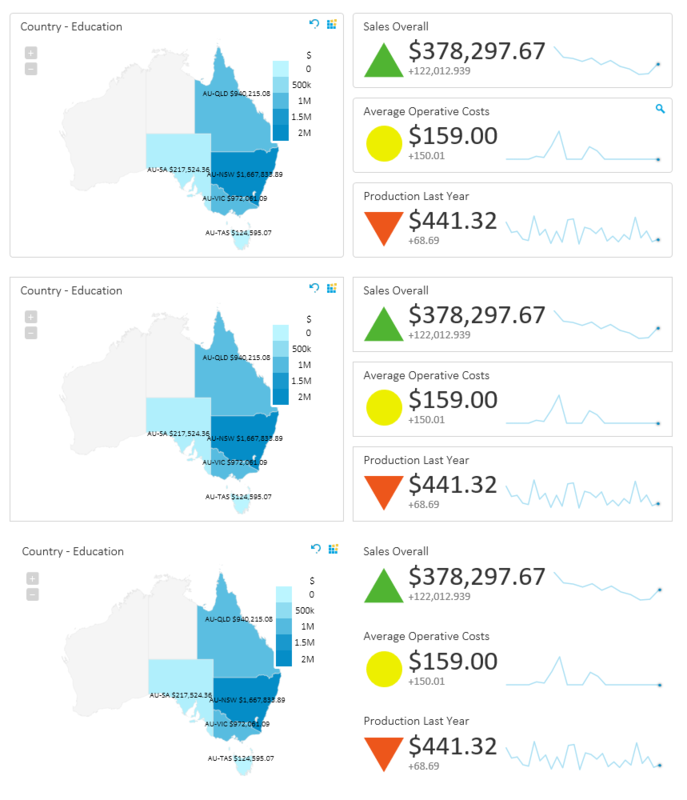 With one click on the tile 'Options' switch position of categories and series and turn around impression of the data on the chart visualization. Useful feature when returned data from OLAP and SQL sources does not have structure of rows and columns we would like to use on the chart. Select series of the data to calculate and display 'Trend Line' on supported chart types (Line Chart, Column Chart, Area Chart, Bubble Chart). Select tile 'Options' in dashboard 'Design View' to select 'Trend Line' series that are displayed in the same color as selected series of data. 'Trend Line' helps user to quickly detect, if observed value is below or above current trend for the series. 'Trend Line' is based on Linear Trend equation. 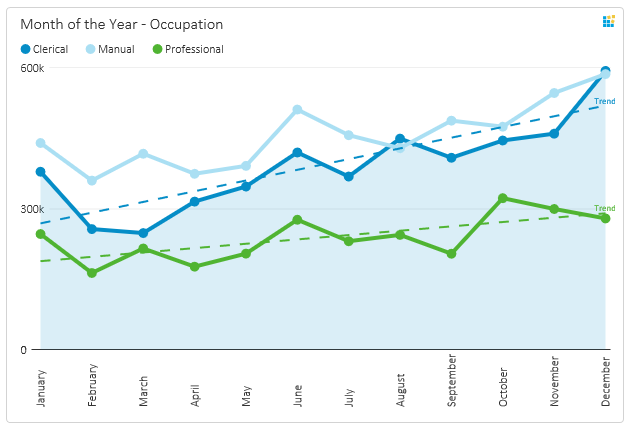 For supported dashboard charts (Line Chart, Column Chart, Area Chart, Bubble Chart) select tile 'Options' and select series to calculate and display 'Average Line', which is displayed in the same color as selected series on the dashboard chart. 'Average Line' helps user to quickly detect, if observed value is below or above current average for the series. 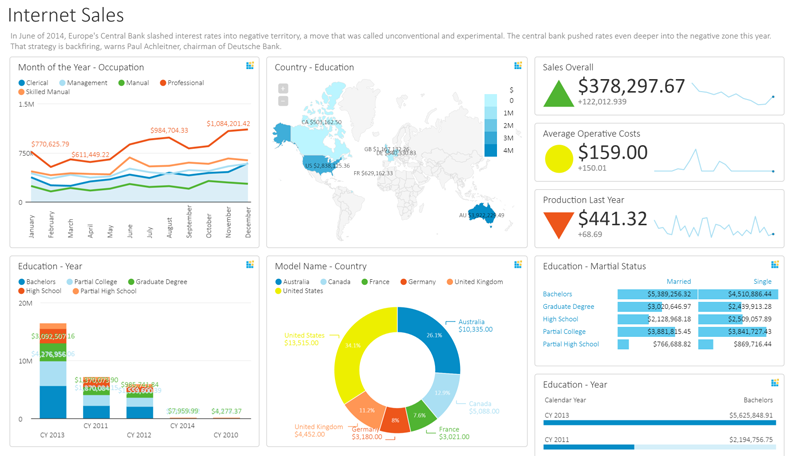 Customize appearance of the chart legend on each individual tile on the dashboard. Legend position could be set in tiles 'Options' and could be set to 'Top', 'Right' and 'None' position value. Dashboard tile border is displayed with rounded edges by default. In 'Design View' dashboard 'Details' -> 'General' settings tile border could be set to 'Square' or 'None' borders. Download 'Kyubit Business Intelligence OLAP analysis - User Manual' which covers all aspects of 'Kyubit Business Intelligence' KPI software.